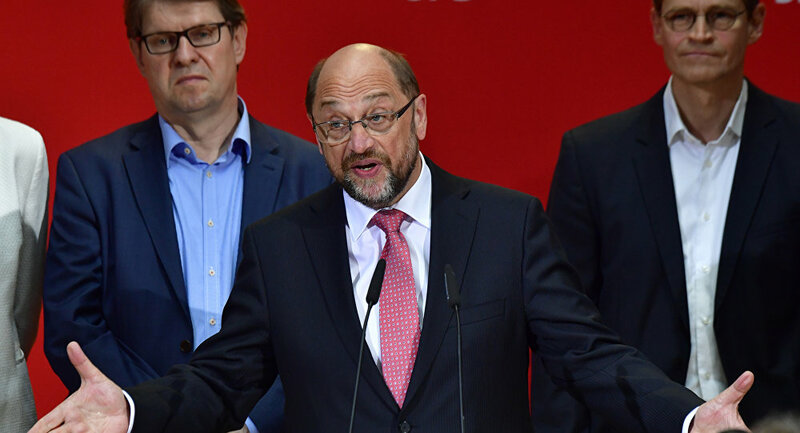 25 percent of the respondents support Social Democratic Party (SPD) in Germany, while Germany's Christian Democratic Union (CDU) received 38 percent of popular support, according to opinion poll. BERLIN (Sputnik) — Germany's Christian Democratic Union (CDU) led by incumbent Chancellor Angela Merkel received 38 percent of popular support and maintained its lead over Social Democratic Party (SPD), which lost 1 percent this week, a new poll showed on Sunday. According to the Emnid survey, only 25 percent of the respondents support SPD, which is a decrease in comparison to the result of the poll published on May 20. Other parties such as The Left, Alliance 90/The Greens, Free Democratic Party (FDP) and the eurosceptic Alternative for Germany (AfD) would receive 8 percent each. The poll was conducted on May 18-23 and involved 1,703 people. The elections to Germany's Bundestag are set for September 24.